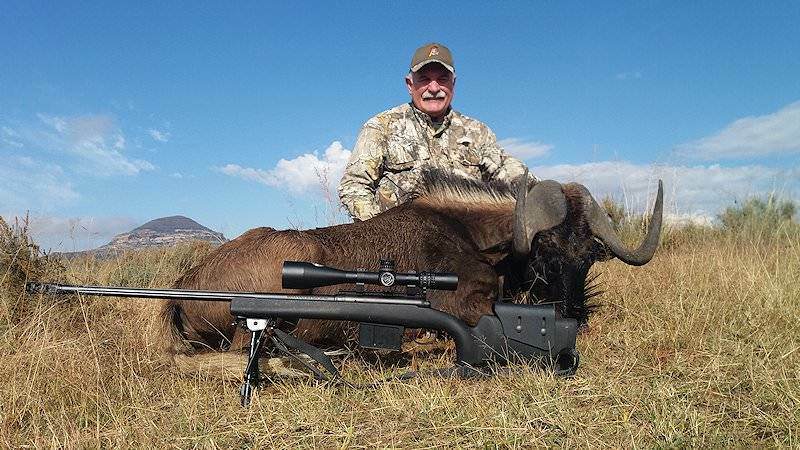 Long shots are often required when hunting black wildebeest on the plains of South Africa. 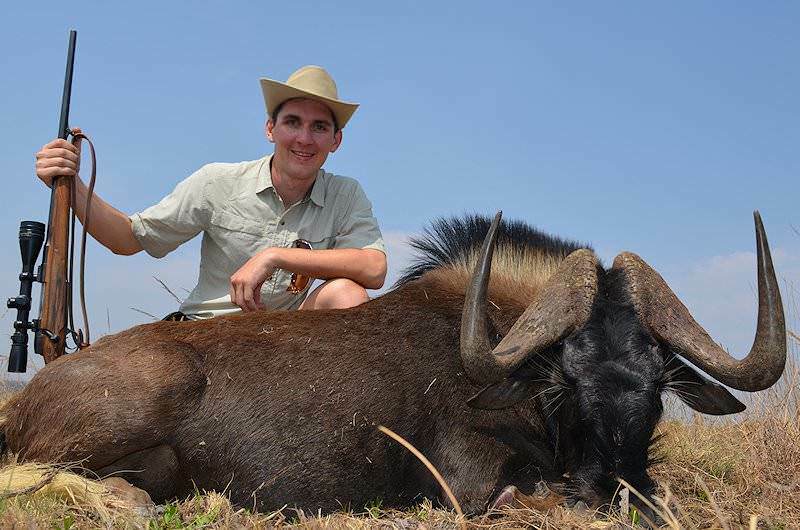 At first glance, hunting black wildebeest may seem rather easy, as on the open plains where he is often found, he will be relatively easy to locate. 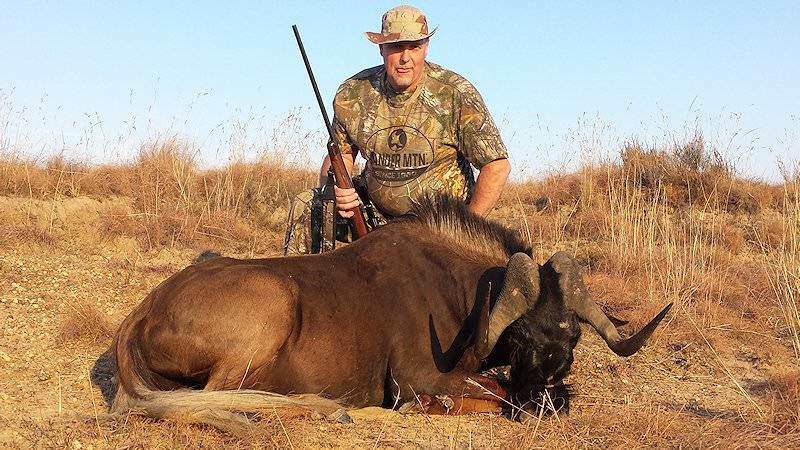 However, closing the distance on him may be an entirely different matter; his excellent senses and herd instinct make hunting black wildebeest quite a challenge. This member of the antelope family is an ox-like animal with unusual horns, a beard, and hair on his nose. He is dark brown in color with a horse-like tail, which is almost pure white. 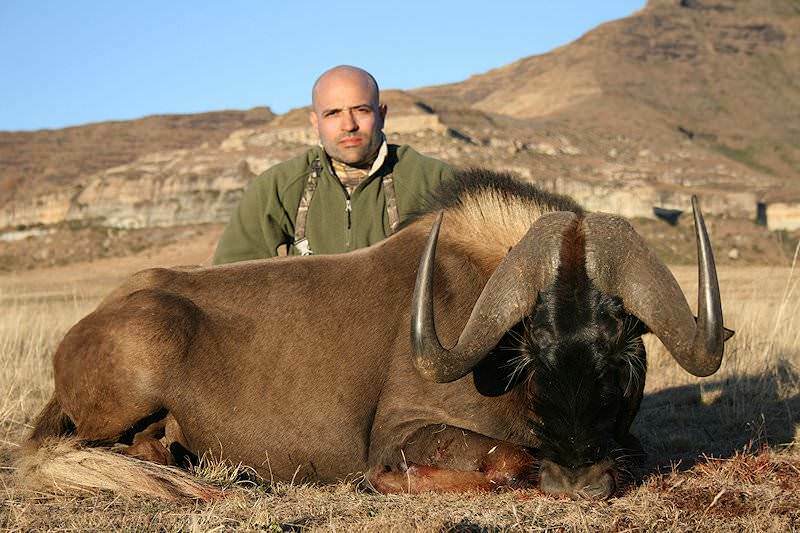 As such, he is sometimes referred to as the white-tailed gnu. These strange looking “beests” occur naturally only in South Africa. With both sexes carrying horns, it sometimes takes quite a bit of patience to distinguish the bulls from the cows. 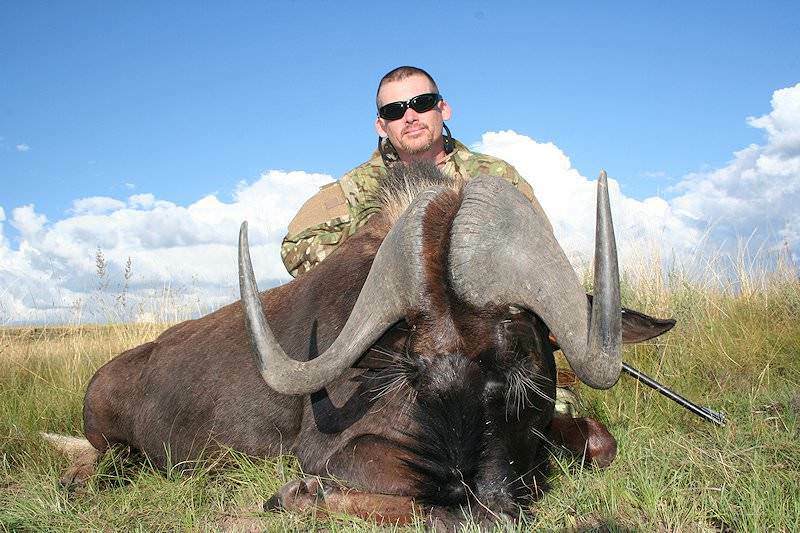 Hunting black wildebeest is most likely best pursued during the morning or late afternoon while the herd is grazing. During cool weather, they will graze anytime, but when it is warm, they tend to rest during the hottest part of the day. 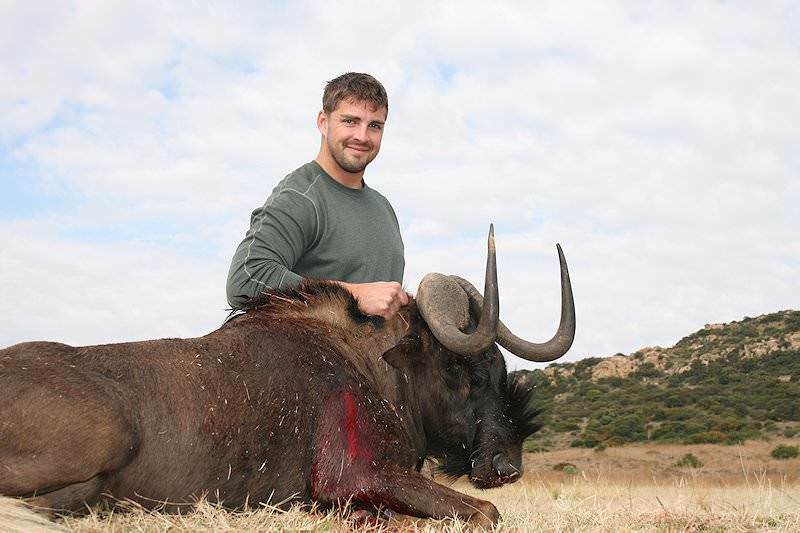 Caution is the “watch word” when hunting black wildebeest, as he can be very aggressive when mating, disturbed, or wounded. This 'clown of the plains', as he is often referred to, will often be seen trotting in circles and chasing other members of the herd. 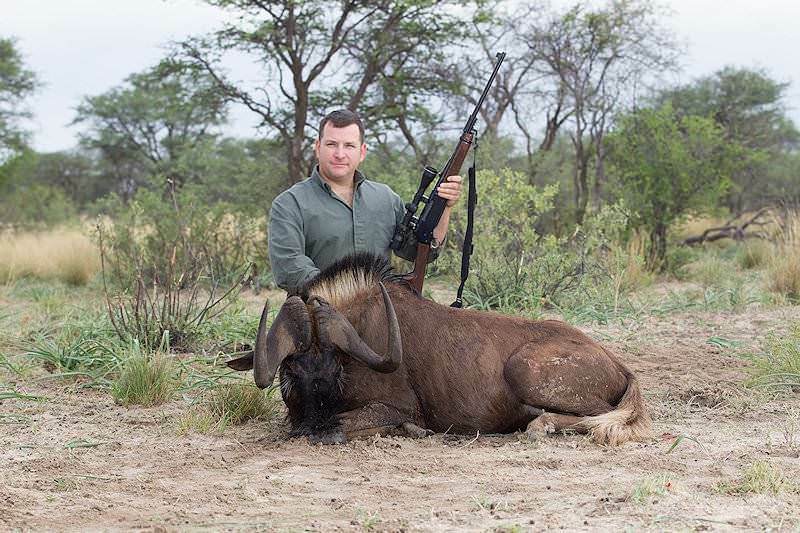 Hunting black wildebeest in open terrain calls for a minimum of .270 caliber with a good 150-grain bullet. The 7mm mag or one of the .300 magnums is an even better choice. These guys are tough, so always use heavy-for-caliber premium bullets. Follow the back edge of the front leg and place your shot one third up into the body, never more than half way up. 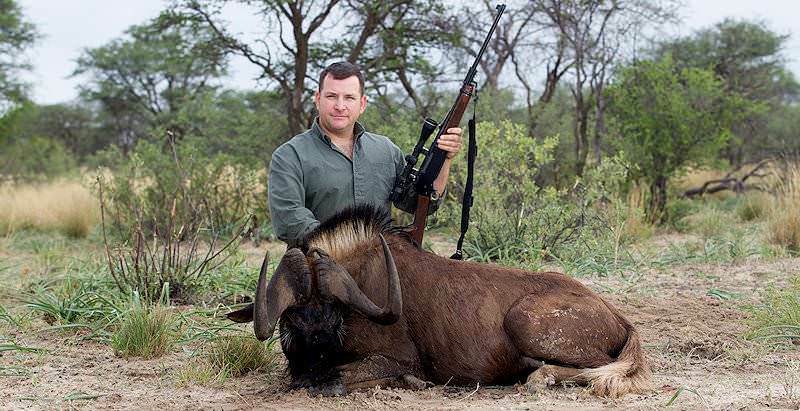 Hunting black wildebeest in bushveld conditions may well call for even larger calibers, like the 9.3mm or the .375. Your Professional Hunter will be your best guide here. 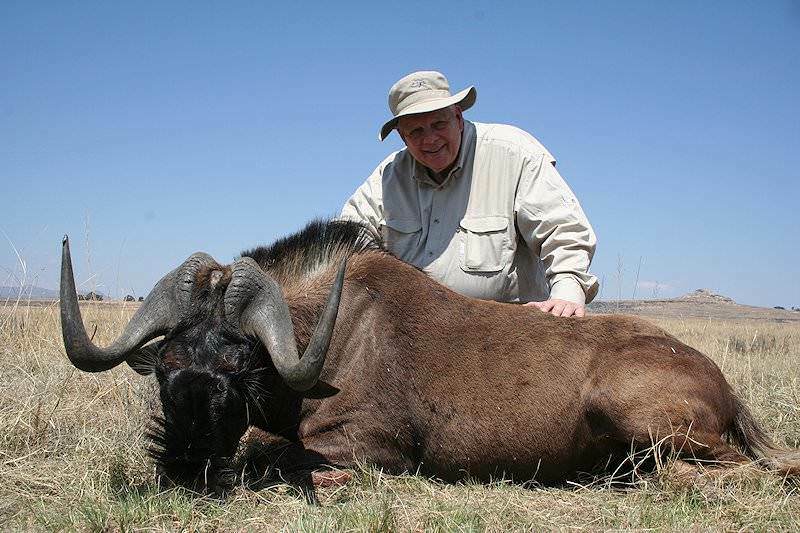 This 5-day beginner's package includes a unique selection of plains game trophy animals, specifically white blesbok, springbok and black wildebeest. 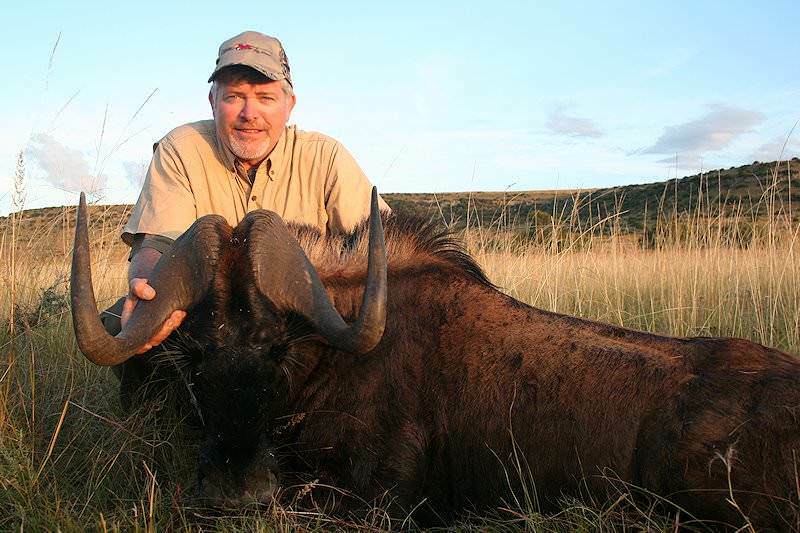 The hunt is conducted on the wide, open plains of South Africa's eastern Free State. 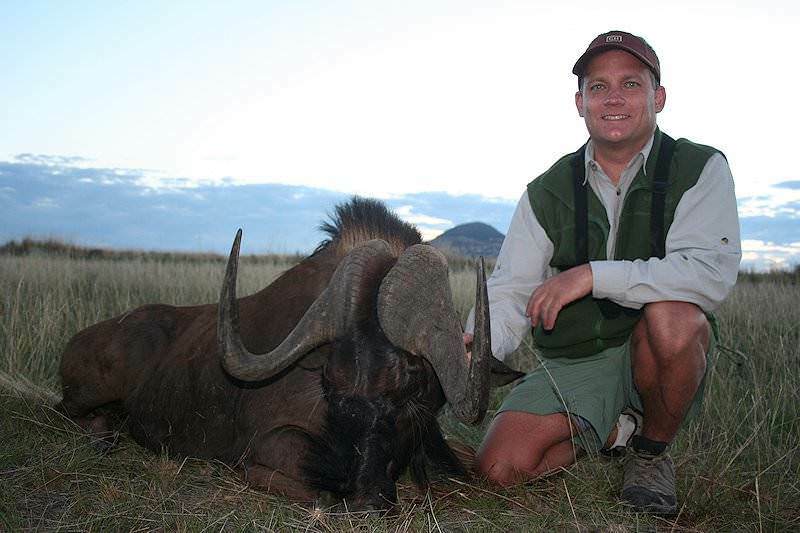 Two weeks hunting in South Africa's two most fruitful hunting areas - the bushveld and eastern Free State. 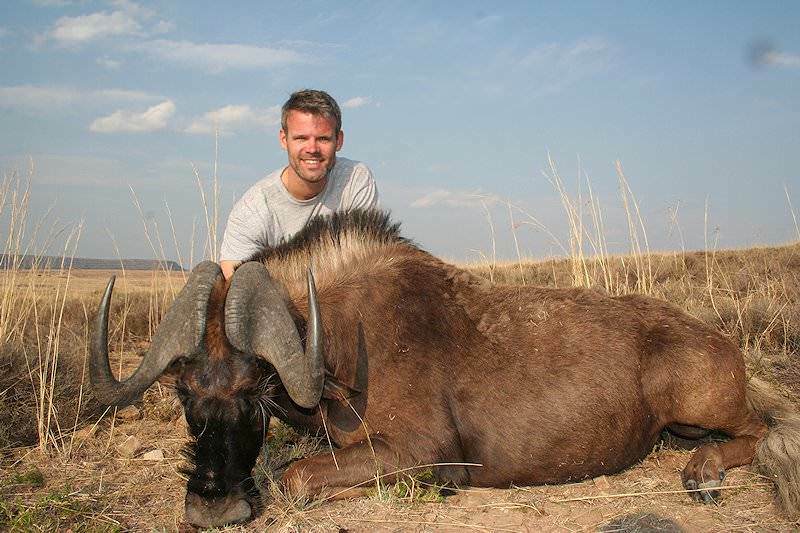 An impressive array of plains game trophies complete the bag, including kudu impala, blue wildebeest, zebra, black wildebeest, springbok and blesbok. 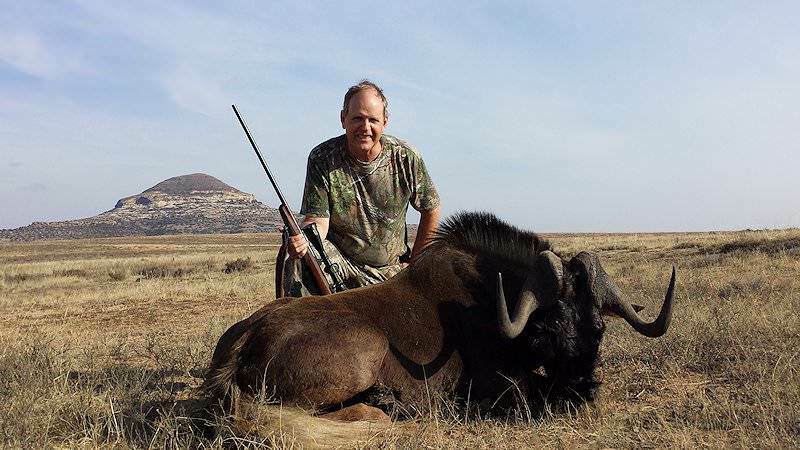 A unforgettable three-week adventure hunting across South Africa's iconic bushveld, the hills of the Eastern Cape and the vast, open plains of the eastern Free State. 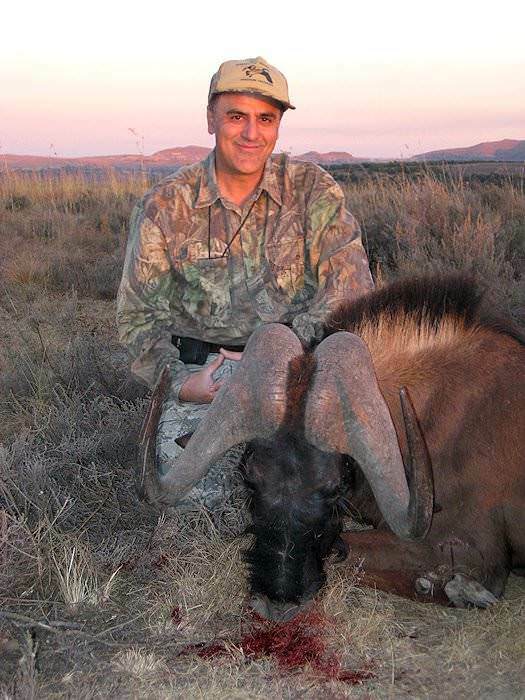 Among the twelve striking trophies included you'll find the likes of black wildebeest, kudu and gemsbok.